All our washers are manufactured from the optimum quality raw material, which is sourced from well-known suppliers. We have been catering to the needs of automobile and shipping industries, where these products are in great demand. Our washers offer high resistance to corrosion and thus last for a longer period of time. Our washers come in various shapes and sizes and thus you can choose as per your requirement. We ensure to delight you by offering all the products at pocket friendly prices and delivering them within the stipulated time period. 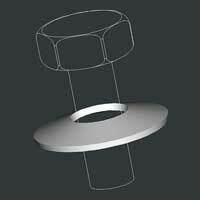 With quality products, we have achieved a landmark as one of the proficient Split Pins Manufacturers.